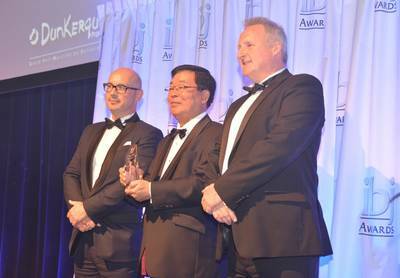 Vessel performance monitoring and optimization solution ClassNK-NAPA GREEN was named the maritime industry’s top IT system by earning the IT Solutions Award at the International Bulk Journal (IBJ) Awards held at the Beurs-World Trade Center in Rotterdam on 17 November. The software solution, developed jointly by leading classification society ClassNK and leading global maritime software company NAPA, was recognized both as an advanced technical achievement and for reductions in fuel costs it has helped achieve and validate on actual vessels in service. Held annually by the International Bulk Journal, the IBJ Awards recognize companies and individuals for their contributions to the bulk cargo sector and wider maritime industry in a variety of categories including environmental protection, bulk logistics and innovative technology. The Awards independent panel of judges chose ClassNK-NAPA GREEN from a number of nominated IT solutions for the technical achievement represented by the system, as well as its contribution to reductions in fuel costs and CO2 emissions from global shipping. actual vessel operating conditions with an accuracy of as much as 99.6%. In addition to installations on container carriers and Ro-Ro vessels, which have produced verified fuel savings of between 4-6%, ClassNK-NAPA GREEN has also been installed on bulk carriers built by Imabari Shipbuilding and Sanoyas Shipbuilding among others, and is currently being used by a number of shipbuilders to better understand the performance of their vessels in actual ocean conditions and optimize future designs.ClassNK Chairman and President Noboru Ueda attended the ceremony, and accepted the award on behalf of NAPA and ClassNK. Speaking on the occasion, Chairman and President Noboru Ueda said: “It is an honor to receive this award and have ClassNK-NAPA GREEN recognized both by IBJ and the distinguished panel of judges.